This beer pours a clear dark amber with an off white head and moderate carbonation. Interesting nose on this beer; light caramel malts, mild hop presence and that good old fashion German skunk. I still don’t know where the skunk comes from but it seems to be in a lot of German beers especially if bottled in a green bottle. Well that German skunk is in the taste of this beer also. It starts with a nice caramel malt sweetness then a little bit of that bite starts to make itself known but it is quickly replaced with a cleansing effervescence and then, you guessed it that German Skunk along with a dry hop finish. The skunky bite stays with you longer than the hops do but it also fades to little or no final aftertaste. This sounds a little harsh but it’s really not, I do actually like this beer. The Belgians have their “Funk” and the Germans have their “Skunk”. The beer is warming up a bit; it is now at 64 degrees. It has gained a little more of a malt sweetness as it opens up a little. All and all this was a good beer. 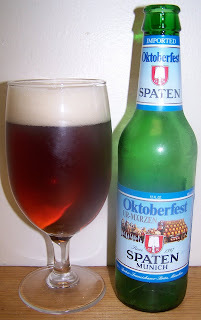 Not my favorite Oktoberfest but still a good beer. That German hop and skunk taste but me back just a little. I don’t mind it on a pilsner or other lighter more refreshing beers but I really didn’t care for it as much on an Oktoberfest. Still, it was a good beer and I do recommend it to anyone that likes a caramel malt lager with that classic German bite (skunk). If I have to give a rating it would be a B.
Ok, tried a new Belgian Ale tonight! Houblon Chouffe Dobbelen IPA Tripel. This was a VERY strong beer at about 9% ABV. Also VERY hoppy (its an IPA anyway). Initially, it was too cold and the hops were the majority of the flavor. Then it hit a sweet spot where the hops were perfectly balanced. Then it got bitter again toward the end. This was finished in the bottle, so it was "dirty." Overall, though, a much better IPA than most I've tried. I purchased this one at Steve's in Madison as well. It sounds like Steve’s is a gold mine for good beers. The Houblon Chouffe is one of the few Belgian IPAs that work for me. I don’t care for most of the American made Belgian IPAs. I had this at the Belgian event and did a review of from the leftovers. http://johnsbierblog.blogspot.com/2009/09/houblon-chouffe-dobbelen-ipa-tripel.html. The bottle conditioning leaves behind yeast sediment called Lees in the bottom of the bottle. Generally you do not pour the lees into the glass, it will change the flavor of the beer. Pour slowly and keep a few ounces of ale and the lees in the bottle. That is unless you want that flavor. You can always pour the lees an empty glass. If Steve’s carries this beer then you should the La Chouffe (strong pale), Mc Chouffe (strong dark) and the N'Ice Chouffe (Christmas strong dark). Send me an email and I’ll send you my spread sheet. I have close to 450 beers on there. You could get some references and suggestions on some Belgians from it.